Sizzling Brownie has been gaining popularity among the foodies since quite a while now. The trend of including Sizzling Brownie in the dessert menu has spread like a wild fire. But it is all justified. Sizzling Brownie is one of the most magical desserts. It is fairly easy to make Sizzling Brownie at home, when you come to the think of it. The assembly part is indeed the easiest one. A proper and well-made sizzling brownie consists of a warm, chocolaty walnut brownie, a big dollop of vanilla ice-cream and a generous helping of chocolate sauce served on a very hot cast iron sizzler plate. It is a bubbly and smoky affair. As the chocolate sauce flows down the ice-cream and brownie, it falls onto the hot sizzler plate and comes to a boil instantaneously, creating a cloud of smoke and the characteristic sizzling sound. Therefore, it is very much important that the sizzler plate be properly heated and the chocolate sauce be poured in abundant. Excuse me for the bad picture quality. It was all smoky, which made it difficult for me to click good pictures. The brownie should be dense and not spongy like cake. I like my brownie harder and to have a nice crust, so I bake for a little longer. Adding walnuts to the brownie gives it a nice texture and nuttiness. The best way to have Sizzling Brownie is to eat directly from the sizzler plate. So, you should use small sized sizzler plates. It will look decent. The real fun lies in scraping the thick, bubbling chocolate sauce off the sizzler plate. Just be careful while eating it because it is too hot. 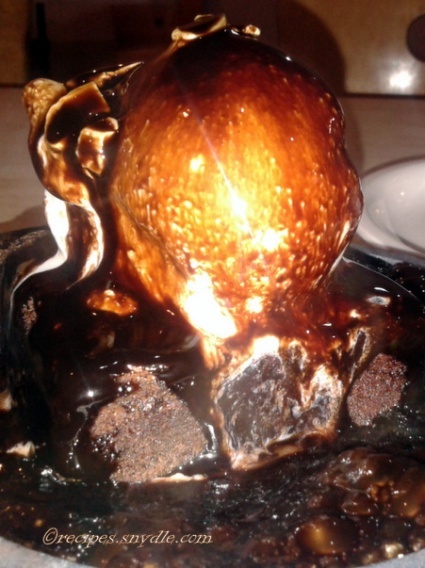 The warm, nutty brownie, hot and smoky chocolate sauce and cool ice-cream – It is a burst of flavors in your mouth! I made the walnut brownie and chocolate sauce at home. The brownie recipe is Chef Sanjeev Kapoor’s recipe. I used store-bought vanilla ice-cream. And for a change, I added a dash of rum to the chocolate sauce! 😀 But if you are going to make Sizzling Brownie for your kids, or you do not happen to like alcohol, you can simply give rum a pass. Let us see how to make Sizzling Brownie. Please use premium quality dark chocolate and milk chocolate for making the Walnut Brownie and the Boozy Chocolate Sauce. You can make the sauce or brownie a day before and store them in the refrigerator. This will help reduce the work for you. Just warm up the brownie in the microwave oven before assembling the sizzling brownie. Sift the refined flour / maida and baking powder together in a bowl. Mix well with a spoon. Set aside for a while. Grind the granulated sugar to make castor sugar out of it. Take another bowl and break the eggs into it. Whisk the eggs for a few seconds till they turn frothy. I used a hand-held blender with a whisk attachment to whisk the eggs. If you do not have it at hand, you can simply use a fork to whisk the eggs. Add in the vanilla essence to the eggs and whisk again. Next, we add in the castor sugar to the eggs and whisk it well. Now we need to melt the chocolate and butter together, before we add them to the egg mixture. So combine the chocolate and butter in a bowl and microwave them on the lowest heat for about 45 seconds. Whisk them well to form a smooth mixture. If you do not have a microwave oven, you can melt the chocolate and butter using the double-boiler method. Heat some water in a deep pan and bring it to boil. Place the bowl containing the chocolate and butter over the edge of the pan. The chocolate and butter will melt from the heat of the steam coming up from the boiling water. Gently stir them with a spoon continuously as they melt. Make sure the base of the bowl containing the chocolate does not come in direct contact with the boiling water, else the chocolate will burn. Now add in the dry ingredients (maida + baking powder) to the egg mixture and whisk it lightly. Pour in the melted chocolate and butter mixture and whisk again with a light hand. We do not need to vigorously whisk the brownie batter like we whisk the cake batter. Otherwise, the brownie won’t turn out dense. Toss in the chopped walnuts and fold them gently into the brownie batter. Grease a baking dish (preferably glass or silicon) with some butter. Transfer the batter into the greased baking dish. Bake the brownie at 160 degrees Celsius for about 35 to 40 minutes. Alternatively, you can bake the brownie in the microwave on high for about 7 minutes. Chocolate walnut brownie is ready. Allow it to cool down a bit and then remove it from the mould. Cut the brownie into big, 3 inches squares. Take milk and butter together in a saucepan. Heat them on low flame, whisking constantly. When the milk is hot and forms tiny bubbles along the sides of the pan, add in the dark chocolate and milk chocolate. Whisk it nicely so that the chocolate melts well and there are no lumps in the sauce. Heat the sauce for another minute as you whisk it constantly. The sauce will now be smooth, glossy and a bit thick. It should be of pourable consistency; sticky but not very thick. Else it won’t sizzle well on the plate. Remove the saucepan off the flame and whisk it lightly for a few more seconds. Add in the rum and mix well. Chocolate sauce is ready. Transfer it to a cup and allow it to cool down to room temperature. We need a slice of pineapple and super-frozen vanilla ice-cream. Heat the sizzler plate on the stove top till it is almost smoking hot. Carefully lift the sizzler plate with a pair of tongs and place it on the wooden plate. Place a slice of pineapple in the center of the sizzler plate. Place a brownie on the pineapple slice, so that it won’t burn. Scoop out a big dollop of vanilla ice-cream and place it on the top of the brownie. Now take this arrangement to the dining table and sit down with the cup of boozy chocolate sauce. 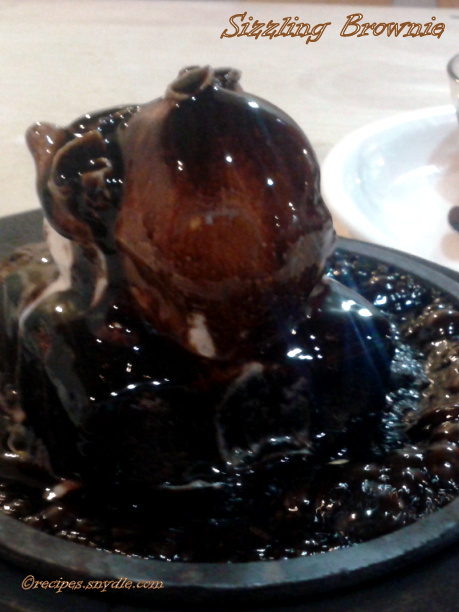 Generously pour the chocolate sauce over the ice-cream and watch it flow down to the hot sizzler plate. Moment of truth! It would get all smoky and bubbly! The aroma of burning chocolate will fill your senses. 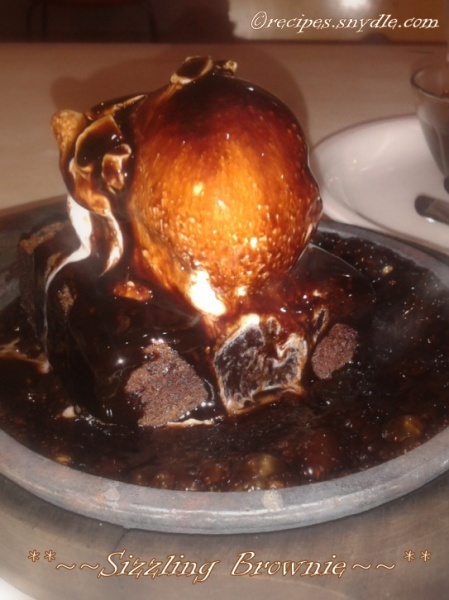 Wait no more and dig into the sizzling brownie, but carefully because it’s really hot! Enjoy!